Signed picture of Stan Willemse the Chelsea footballer. Home » Signed pictures » Signed picture of Stan Willemse the Chelsea footballer. Stanley "Stan" Willemse (23 August 1924 – 5 August 2011) was an English footballer who played as a left-back for Brighton and Hove Albion, Chelsea and Leyton Orient. This is an A4 size, black and white full action picture of Stan Willemse the Chelsea footballer. This item is taken from a Charles Buchan football monthly magazine of the time and has been hand signed for me by Stan using a fine black pen. 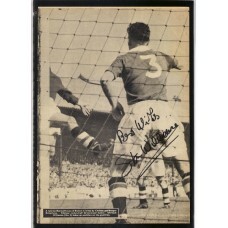 Stan Willemse signed for Chelsea in 1949 for £6,000. He earned a reputation as a hard-tackling defender whilst with the club, and formed the backbone of the team which won the League Championship in 1954–55, alongside the likes of Roy Bentley, Ken Armstrong, Eric Parsons and Derek Saunders, playing 39 games that season. He stayed at Chelsea for one more season after that, and signed for Leyton Orient in 1956. When Chelsea won the title again in the 2004–05 season, Willemse and fellow 1955 title-winner Roy Bentley carried out the trophy at Stamford Bridge for it to be presented to captain John Terry. Stan Willemse died on 5th August 2011 aged 86.